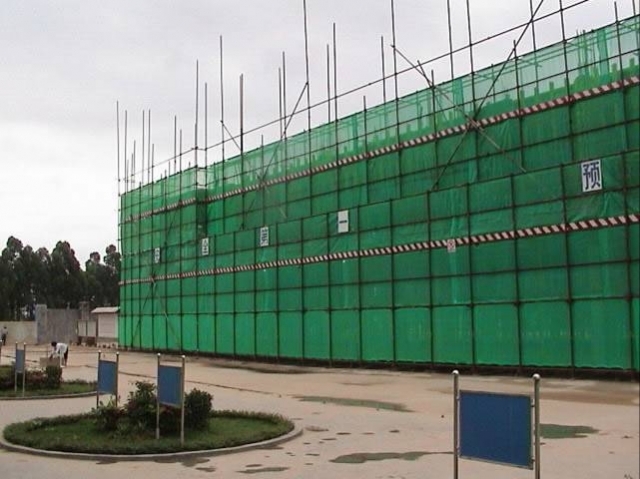 Safety net is one of the important facilities of the construction safety protection, safety net should be set in the construction organization design has clear rules and requirements, technologically sophisticated design should be done. Safety net type: safety net by hanging vertical and horizontal set way points two kinds. Vertical set used in high-rise building construction scaffolding, more lateral hung safety net enclosure, generally USES fine woven nylon rope safety net. Scaffolding safety net should be sealed, and external fixation. 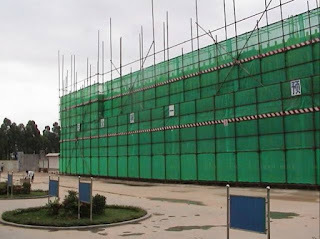 Level of safety net for multilayer construction scaffolding, more is to use hemp rope 9 mm in diameter, coir rope or nylon rope weaving, general specifications for the 3 m by 6 m, 5 cm of mesh, each a good safety net should be able to withstand the pounding of not less than 1600 n load. Up from the floor on the second floor of its a safety net, and set a every 3 ~ 4 layers, and then set up a safety net with the construction elevation. Wants net twine is not damaged, take root and firm, taut, circle, joining together tightly, the net bar the strut appropriate hand pole with their feet. Minimum network is not less than 3 m wide, a layer of network should be 6 m wide. (1) using the method of exterior wall window frame for: 1 on the wall of the upper window rail and safety net of the cross tie, within the bar on the next layer 2 window wall and safety net of diagonal keep old rail is put in the wall and the tie bar 2, 3 for safety net of the diagonal spacing should be not more than 4 m.
(2) use of derrick set up a safety net of steel, steel derrick can be used without a window wall building safety net, the reserved hole in metope, wear into the pin and wedge tight with peg, with Ф 14 holes on lock plate, in order to hang a derrick safety net, steel derrick as Ф 12 bar, about 1.56 m long, the top hook, hook on the back of the welding a peg to hang a safety net. Bottom welding have installed diagonal activities hinge seat and leg against the wall, near the upper hook (peg) still have wallboard and hang a nylon rope ring welding, rely on the role of the wallboard is to guarantee the derrick stress does not occur after being optional. Derrick spacing is commonly 3 ~ 4 m.
(3) the first layer of long-span safety net: the first layer of large-span safety net, can use the Chinese fir from brace set-up, also can be used as a network.